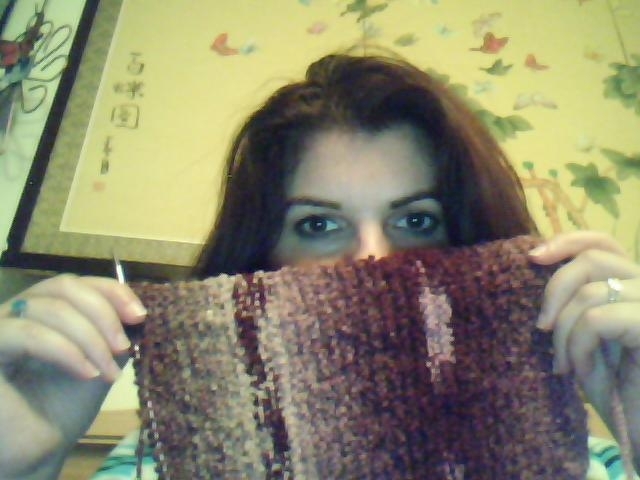 how many years will it take for me to finish this scarf? Not big enough yet errrrgh! This is messing with my master plan for Christmas. I thought I could whip out a bunch of these for my beloved friends and co-workers. NOT! I think I better get crafty in more than one way. I recently bought a kit for learning to bead. It was very simplistic but I learned some basics and now I have a beading tray and some tools. I also got a ton of ideas! I think I could probably whip out a bunch of jewelry quicker than I can knit! I also found a neat origami kit at a barnes and noble in arizona called The Jewelgami Kit. I love origami and I think making jewelry out of it could be fun. What a neat gift idea too. Sooo, I wonder what else this sneaky elf can come up with???? Hmmmmmmmmmmm…..
Do I get a scarf? Have you chopped all your hair off yet? Is your scarf 6 inches yet?